Our Founder and Creative Director, Michelle & Shannon, recently spent four inspiring days in New York City with the Moroccanoil Academy! As our valued guests know well, we take education seriously at Salon130 and try to ensure our stylists take regular trips, both for technique enhancement but also the inspiration of a new environment to refresh the mind and body. 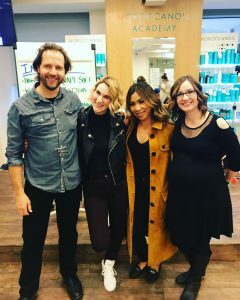 The Moroccanoil Academy hosted a 3 day advanced cutting techniques class with the renowned celebrity stylist, Peter Gray, as well as Kelly Bowen, Moroccanoil Educator! “ Gray established his reputation in London in the 1990’s working with photographers Sølve Sundsbø, Miles Aldridge and Richard Burbridge and has been creative director of hair on the runways of Maison Martin Margiela, Junya Watanabe, Vivienne Westwood, Badgely Mishka and Hermès. He’s been christened one of the four kings of fashion week alongside Garren, Eugene Soleiman and Danilo: styling icons whose hair designs rule the runway. Gray has contributed to a range of luxury titles including Italian, American and British Vogue, Harper’s Bazaar, Numero, Dazed and Another Magazine. His celebrity clients include Gwenyth Paltrow, Thandie Newton, Liv Tyler, Claire Danes, Michelle Williams and Cate Blanchett”. Michelle & Shannon spent their time learning a total of six new techniques created by Peter and the Moroccanoil Creative Team. 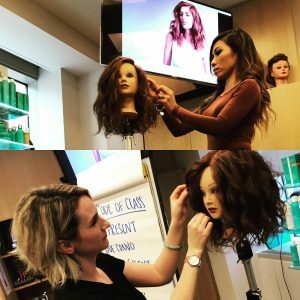 The girls were thrilled that the class was different than the norm as instead of showing them specific haircuts to mimic, they were being given techniques and the knowledge of how to take these and cater them to each individual client’s needs! They were beautifully crafted haircuts and loose styles that can be achieved efficiently without sacrificing the precision of their haircut. It was a fantastic! Michelle and Shannon working on a beachy style done with product and a diffuser, no curling irons were used in the making of this glam look! Along with their new cutting techniques, there was a lot of talk about the importance of an excellent consultation. We need to know our clients before we can know the right cut and style for them. Peter’s ability to read a person just by their body language was something Shannon found very intriguing and was so inspired by, she bought a book on body language as soon as she got home! As an example for the class, Shannon was lucky enough to be used as a model for Peter to do a consultation and cut! Just by watching the way she walked and stood, Peter could tell that she has at least 2 children (she actually has three! 😉 ) and therefore needed an easy to wear style to save her precious time in the morning. He also shaped his haircut based on the way she ran her fingers through her hair, a tell as to where a client wants body, or length, etc. One last tip from the class that resonated with the girls was to try and move away from the classic sectioning everyone is taught and instead learn to section based off of the clients exact head shape! Wow! 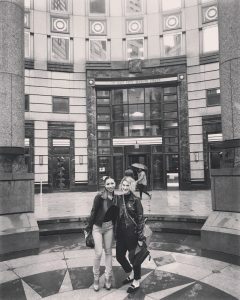 Needless to say, Michelle and Shannon are back in the salon feeling fresh and inspired both by the incredible class they were able to attend but also from the culture and energy of New York City itself! A city where you can’t help but step things up a notch, a stroll down 5th Avenue was enough to make a girl feel ritzy.